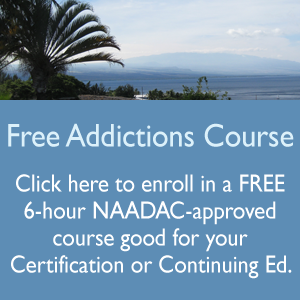 We are now offering FREE enrollment in the course “Professional Ethics and Issues for the Addictions Professional” for ALL registered users on our training site. We hope that you will take advantage of this opportunity to get to know our courses and our academy a little better. This course is a $75 value and includes a certificate for 6-hours of “Verified Home Study”, perfect to add to your certification or re-certifcation requirements. If you complete the course and download your certificate by December 31st, you will receive a 50% discount on a second course of your choice. If you are already registered as a student on our site, you should have received an e-mail from us with the enrollment key. If you didn’t, contact us and we’ll get you a copy of the key. Sounds like a great course!